Dr HN Diwakar Dr John Mukhopadhay Dr Ashok K Sinha Dr Amulya Kr Singh. 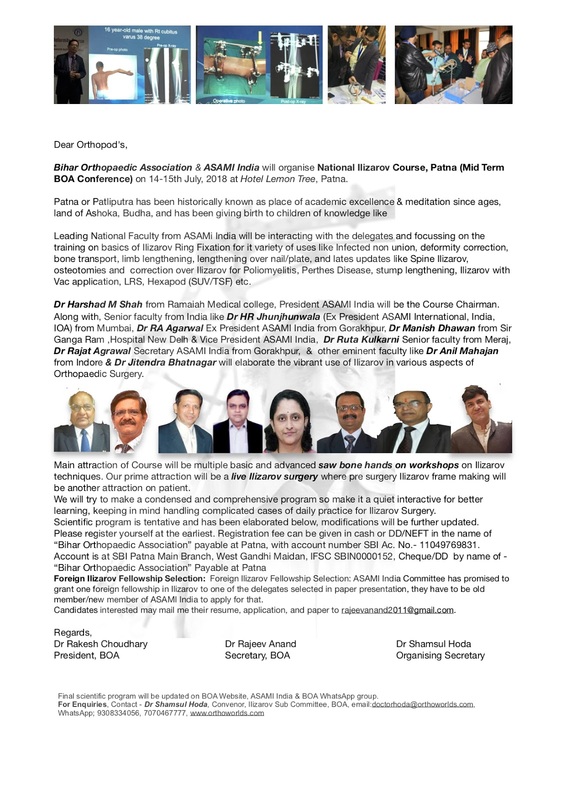 Bihar Orthopaedic Association & ASAMI India will organise National Ilizarov Course, Patna (BOA Mid Term Conference) on 14-15th July 2018, at Hotel Lemon Tree, Patna, Patna. 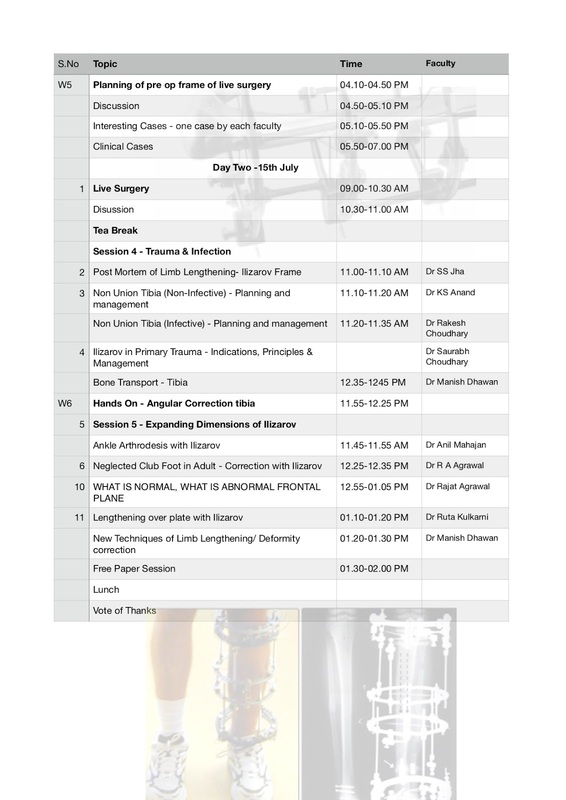 Leading National Faculty from ASAMi India will be interacting with the delegates and focussing on the training on basics of Ilizarov Ring Fixation for it variety of uses like Infected non union, deformity correction, bone transport, limb lengthening, lengthening over nail/plate, and lates updates like Spine Ilizarov, osteotomies and correction over Ilizarov for Poliomyelitis, Perthes Disease, stump lengthening, Ilizarov with Vac application, Hexapod (SUV/TSF) etc. Dr Harshad M Shah from Ramaiah Medical college, President ASAMI India will be the Course Chairman. Along with, Senior faculty from India like Dr HR Jhunjhunwala (Ex President ASAMI International, India, IOA) from Mumbai, Dr RA Agarwal Ex President ASAMI India from Gorakhpur, Dr Manish Dhawan from Sir Ganga Ram ,Hospital New Delh & Vice President ASAMI India, Dr Ruta Kulkarni Senior faculty from Meraj, Dr Rajat Agrawal Secretary ASAMI India from Gorakhpur, Dr Milind Choudhary Ex President ASAMI India from Akola, & other eminent faculty like Dr Anil Mahajan from Indore & Dr Jitendra Bhatnagar will elaborate the vibrant use of Ilizarov in various aspects of Orthopaedic Surgery. Main attraction of Course will be multiple basic and advanced saw bone hands on workshops on Ilizarov techniques. Our prime attraction will be a live Ilizarov surgery where pre surgery Ilizarov frame making will be another attraction on patient. We will try to make a condensed and comprehensive program so make it a quiet interactive for better learning, keeping in mind handling complicated cases of daily practice for Ilizarov Surgery. 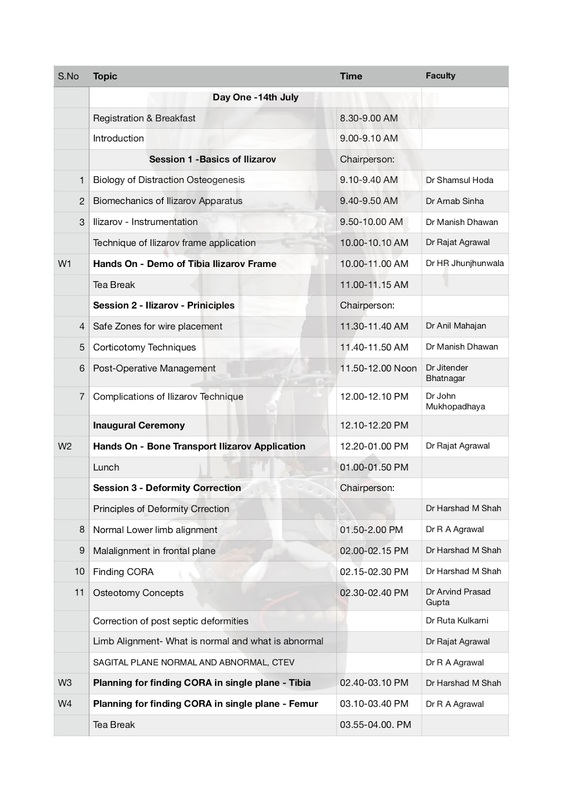 Scientific program is tentative and has been elaborated below, modifications will be further updated. Foreign Ilizarov Fellowship Selection: ASAMI India Committee has promised to grant one foreign fellowship in Ilizarov to one of the delegates selected in paper presentation, they have to be old member/new member of ASAMI India to apply for that. Candidates interested may mail me their resume, application, and paper to rajeevanand2011@gmail.com. 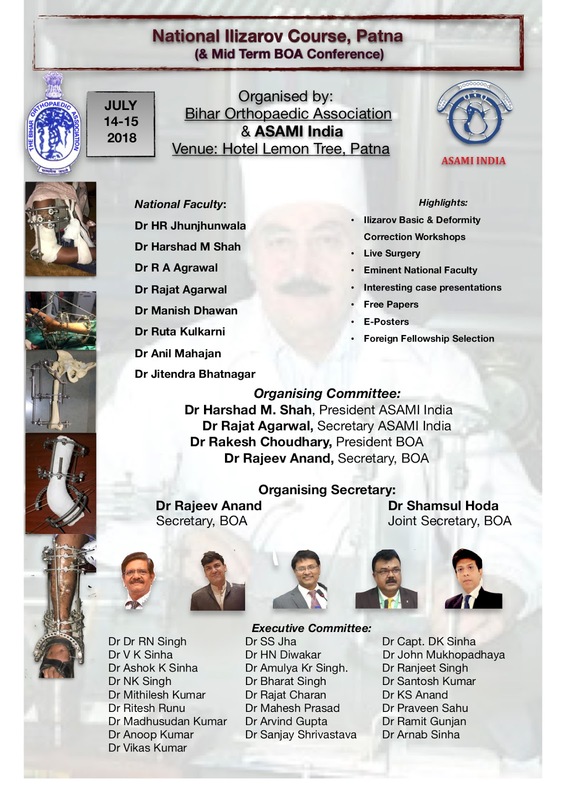 Final scientific program will be updated on ASAMI India & BOA Website/ WhatsApp group. Pay by Cash /DD/NEFT- SBI Ac. No.- 11049769831, SBI Patna Main Branch, West Gandhi Maidan, IFSC SBIN0000152, Cheque/DD by name of- “Bihar Orthopaedic Association” Payable at Patna. 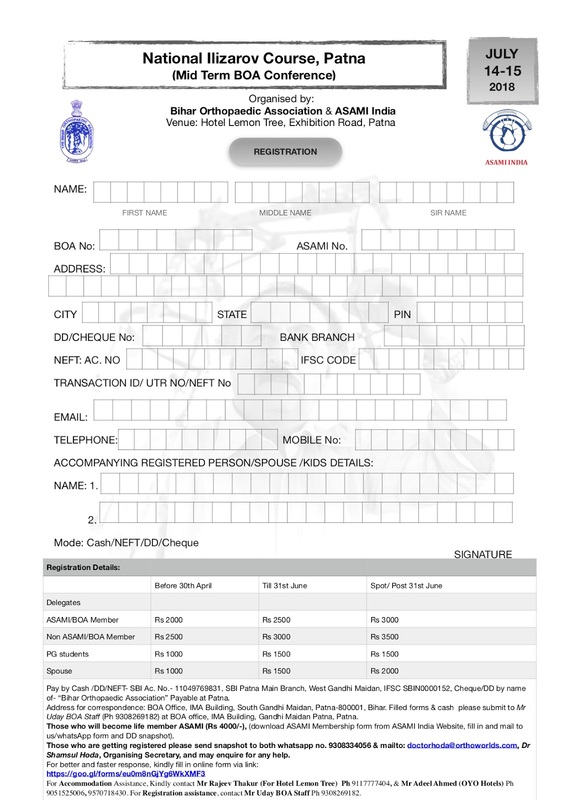 Filled forms & cash please submit filled form to Mr Uday BOA Staff (Ph 9308269182) at BOA office, IMA Building, Gandhi Maidan Patna, Patna. Those who will become life member ASAMI (Rs 4000/=) this time, (download ASAMI Membership form from ASAMI India Website, fill in and mail to us/whatsapp form and DD snapshot), please submit filled form to Mr Uday at BOA office, Patna. Those who are getting registered please send snapshot to both whatsapp no. 9308334056 & mailto: doctorhoda@gmail.com, Dr Shamsul Hoda, Organising Secretary, and may enquire for any help. For Accommodation Assistance, Kindly contact Mr Rajeev Thakur (For Hotel Lemon Tree) Ph 9117777404, &Mr Adeel Ahmed (OYO Hotels) Ph 9051525006, ‬9570718430. For Registration assistance, contact Mr Uday BOA Staff on Ph 9308269182.